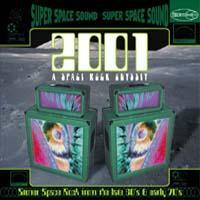 Various Artists - "2001: A Space Rock Odyssey"
With a title like this British import compilation has, you might expect it to be a collection of music by contemporary space rock bands, but this double CD has more to do with 1968, the year Stanley Kubrick's classic 2001: A Space Odyssey was released, than it has to do with anything from the present year. As such, the collection is sub-titled: Stoner Space Rock from the Late 60's and Early 70's. Not all this music is what I would really call space rock, though it all falls into related genres, such as psychedelia, jam-rock, and progressive rock, and is united in its themes of outer space and science fiction. Happily, this is more of a collection for space rock aficionados, than a primer for those looking for an introduction to the genre. Certainly, there are some of the more recognizable names, like Hawkwind, Status Quo, Uriah Heep, and Man, but the producer, John Reed, has dug up a lot of obscure nuggets from the past as well, making this a delight for collectors. Among those lost relics present are two tracks from the all but forgotten Stray, Time Machine, a heavy, Eastern tinged, psychedelic rave-up, and All in Your Mind, a nearly 10-minute long, guitar driven freak-out. Checking in with two tracks is the legendary Notting Hill psychedelic blues band, The Deviants (who would eventually morph into The Pink Fairies, minus their leader, Mick Farren). Rambling B(l)ack Transit Blues is a dark and brooding track about the emptiness of space travel, while Metamorphosis Exploration takes a journey into inner space. Gravy Train provides the excellent, pop-inflected Starlight, Starbright, while Jan Dukes de Grey gives us the title track from their lost psych-folk classic Mice and Rats in the Loft, a sinister 8-minute, Van Der Graaf Generator sounding oddity steeped in Lovecraftian themes of cosmic terror. Other tracks rounding out the collection include the mythological, hard rocker Zeus, performed by Curtis Knight Zeus, featuring former Jimi Hendrix associate Curtis Knight, and future Mötorhead guitarist "Fast" Eddie Clarke, and the wide-eyed, liquid psychedelia of A Distant Thought, a Point of Light and Song From the Fourth Era by CMU (Contemporary Music Unit). The tongue-in-cheek liner notes by David Wells are amusing, if not overly informative, and contain a few factual errors (he erroneously says that Kubrick followed 2001 with the film 2010-Kubrick had nothing to do with the sequel). But unless you have an extremely thorough collection of music from this period, you're bound to find something of interest to tempt your ears here, on two disks worth of great music. More Information can be found at http://www.sanctuaryrecordsgroup.co.uk.